If you decide a ventless gas fireplace would make for a safe and healthy addition to your home, you can look forward to heat and ambiance with none of the mess and hassle of a traditional hearth. It’s not hard to understand the allure of ventless gas fireplaces. On the one hand, they offer heat and a cozy ambiance. On the other hand, they enable you to circumvent what’s often the most challenging aspect of adding a fireplace—proper ventilation. Be aware that there are health concerns associated with ventless gas fireplaces. That being the case, anyone considering one ought to discuss the project with a professional before purchasing. If you decide to move forward, you’re likely to enjoy the fact that ventless gas fireplaces involve fewer hassles than traditional hearths. There’s no splitting of wood, no trudging to and from the woodpile, no messy soot and charred wood to clean up. 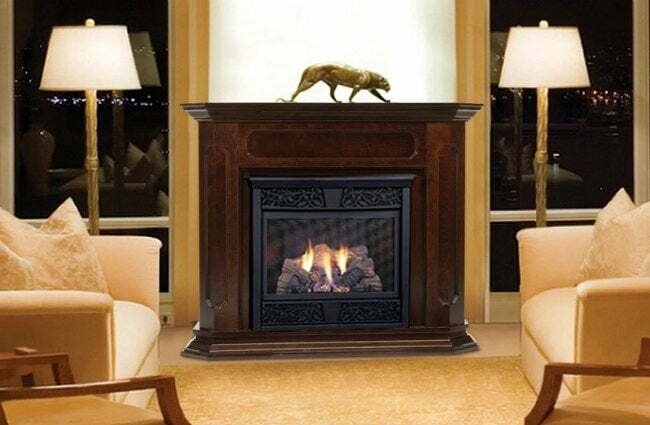 You’ll also like the fact that ventless fireplaces are generally less expensive than their vented counterparts, since the former don’t require exhaust vents or flues to get rid of combustion byproducts. That’s because, at least theoretically, they produce very few byproducts. But again, you should know that some building scientists doubt whether these products truly operate as claimed. One other plus: They don’t need electricity to operate, so if you get hit with a power outage you’ll still have a reliable source of heat.